Opinion about Mrs Thatcher is as divided now as it was when she was Prime Minister. But one thing is certain: what she did to the coal industry can never be undone. We’ve produced this commemorative mug, on sale for £10 (plus £2.50 p&p), and we’re giving £2.50 to the Coal Industry Social Welfare Organisation for each mug we sell. Mrs T cup: dishwasher safe, ceramic mug (a third of a litre capacity). Please allow 10-14 days for delivery. This mug on sale for £10 (plus £2.50 p&p), £2.50 of which will go to support the campaign to save Lewisham A&E see (www.savelewishamhospital.com). The mug is dishwasher safe, ceramic (a third of a litre capacity). Please allow 10-14 days for delivery. 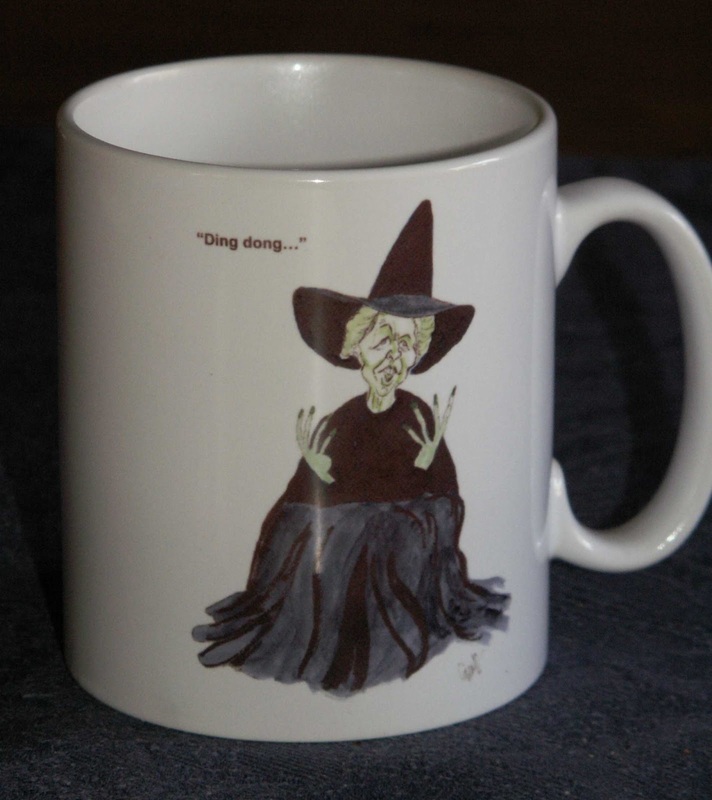 This mug on sale for £10 (plus £2.50 p&p). It is dishwasher safe, ceramic (a third of a litre capacity). Please allow 10-14 days for delivery. We now have the first five Modern Nursery Rhymes in card form, blank inside for your own message. 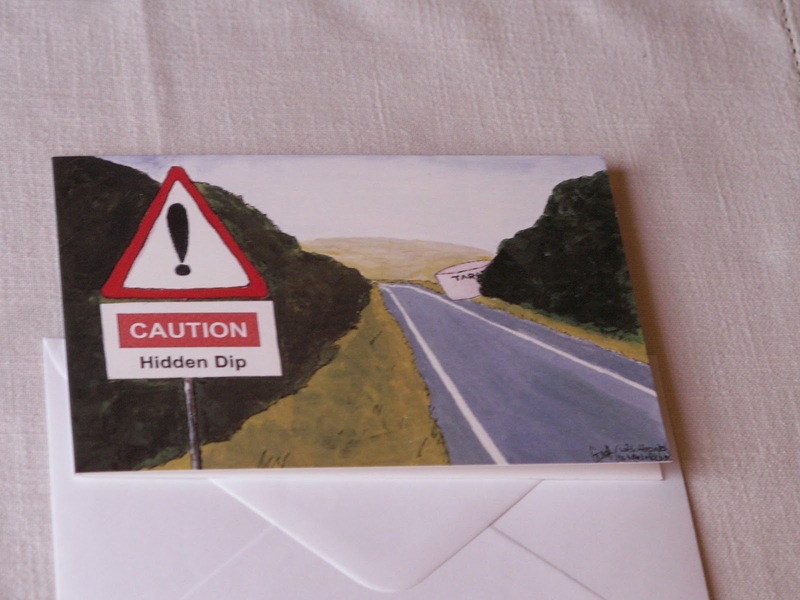 Each card comes with its own white envelope measuring approx 11cm x 16cm. Little Mis Muffet card: (10cm x 15cm approx) and envelope, depicting Little Miss Muffet, with the words: Little Mis Muffet sat on a tuffet eating burgers dripping with grease. A spider dropped down and said with a frown "By God girl - you're getting obese!" Price per card £1.50 plus 70p post & package (UK/EU only). These other cartoon cards are also left blank for your own message. 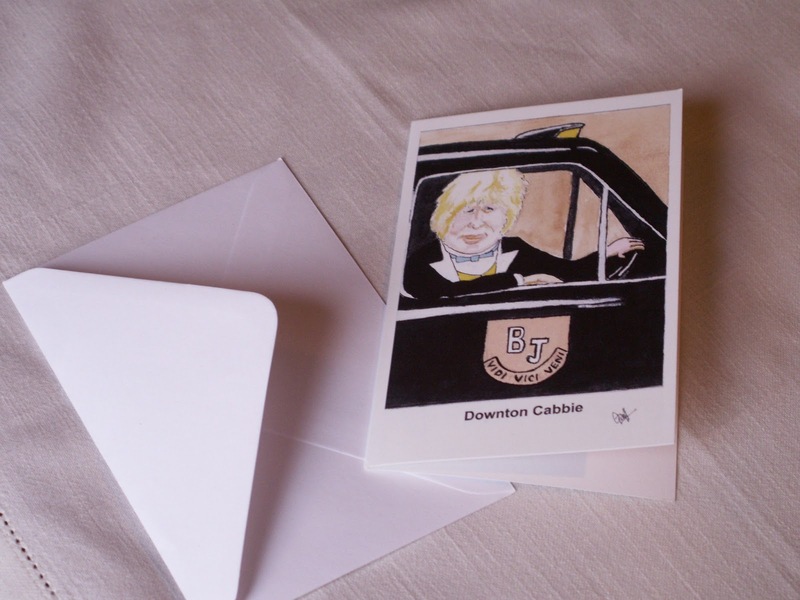 Cartoon card and envelope (10cm x 15cm) depicting Downton Cabbie, with BJ's cab bearing the logo: 'vidi, vici, veni'. Blank inside. These are on sale at £7 each plus £2.50 post & packing, or £30 for all five, with £4.00 post and packing.